Christopher Lee has precisely one line in the recent trailer for The Hobbit: The Battle of the Five Armies, but his little cameo was an unsurprising winner with fans. And, apart from reinforcing that stuff is always better with Chris Lee (maybe Chris can do all the voices for BOTFA — that would be ace! 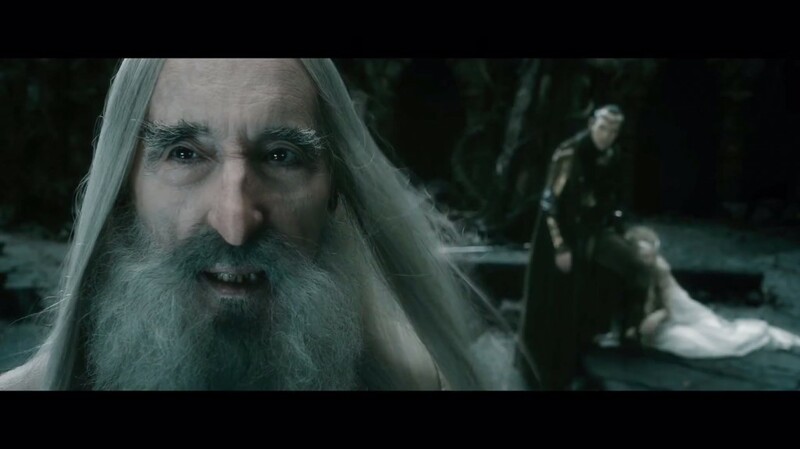 ), it also sparked a surprising amount of speculation about Saruman’s intentions in desiring to confront Sauron alone. Now, we can’t say how the confrontation occurred in canon: we know little more than that the White Council put forth its strength, that Saruman played an important role, and that Sauron deliberately withdrew as he had anticipated and planned for the actions of the Wise. Had Sauron, in fact, already fled? It’s a legitimate interpretation of the texts. However, Tolkien’s writings are a lot more informative about when Saruman “left the path of wisdom”. In this feature, Tedoras examines what The Lord of the Rings, Unfinished Tales, and The Silmarillion have to tell us about Saruman’s fall. Saruman’s character in the upcoming film will doubtlessly be one of the most intriguing aspects of The Battle of the Five Armies; his role at this time in the Third Age is complex. Yet one thing is plain: at some point, Saruman abandons entirely the mandate of the White Council and that of those who sent him forth from the West. Attempting to pinpoint that critical junction with canon — the decisive moment when Saruman turns from ally to traitor — requires a bit of digging through The Lord of the Rings, Unfinished Tales, and The Silmarillion. However, with a proper background context developed and in place, it is possible to determine what key events and actions motivated (or twisted) Saruman into the redoubtable villain of the fourth millenium of the Third Age. One thing is clear in the timeline: when Saruman and the other Istari first arrived in Middle-earth around the year 1000 of the Third Age, there was no hint of what was to come. Indeed, for well over 1,500 years, Saruman remained a faithful servant among the coterie. Yet throughout this period, a darkness welled up that would ultimately come to sunder him from the rest of the White Council: namely surrounding Dol Guldur. Even though almost from the outset, around T.A. 1100, an ill presence could be discerned in Dol Guldur, it was not until T.A. 2060 that the Wise began to murmur about the return of Sauron. Then, a near 800-year jaunt of watchfulness and worry was commenced, of doubt and stirring fear; of great importance is the most portentous year T.A. 2463, in which both the White Council was formed and Smeagol took the Ring. From the convergence of these two events in 2463 emanate two key narrative threads: first, Saruman and Gandalf are brought into closer contact; and second, the Wise come to focus their task on the Rings of Power, and the One itself. As it would turn out, and seemingly contrary to understanding, Saruman’s association with Gandalf was, by no account, salutary for any party. The mingling of the two, and the development of the relationship (which will be soon seen as a rivalry), marks the dawn of Saruman’s divagation; though, of course, as remarkably skilled and prodigiously wise, they could have proved a decisive force for good. However, it is plain from the Unfinished Tales that Gandalf, for some curious reasons, was a thorn in the side of his one-time ally. What we learn is that the White Council, as opposed to uniting the Wise, served as a forum for their division. 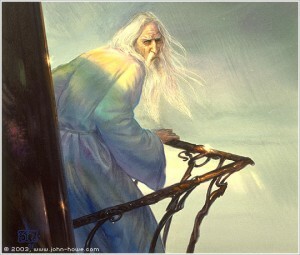 Saruman “soon became jealous of Gandalf,” and their rivalry “turned at last to hatred” (UT 349). Interestingly, however, is that Saruman’s jealousy is not derived simply from Gandalf’s immense strength; but, in a most revealing mode, from Gandalf’s lack of desire to make others subservient to or else reverential of that strength. No clearer distinction can be found than in comparing Gandalf’s relationship with the hobbits of the Shire to that of Saruman’s with his henchmen and servants; to call this a mere difference in style or manner of action, and not something fundamentally deeper, is misguided. 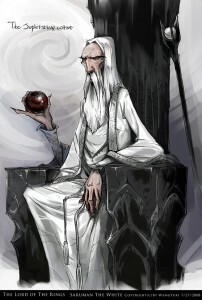 Saruman the White by Wangyuxi. Naturally, because Gandalf was fascinated by the Shire and spent, according to Saruman, an unfoundedly long amount of time and effort there, this region piqued his own curiosity. Had Gandalf’s adventures not come to Saruman’s ears in Council meetings, he would have considered the Shire “beneath his notice” (UT 349). Saruman’s resulting interest in the Shire and the hobbits was, at this time, but “a folly born of pride,” and unconnected with even the wildest thoughts of the Rings of Power (UT 350). Gandalf, upon discovering Saruman’s regard for the Shire, doubted him already, perhaps for the ways in which he let pride and avarice (Saruman was a fan of pipeweed, too) govern his actions. Indeed, that “Galadriel…had wished that Mithrandir should be the head of the Council” served no mitigating purpose (S 300). Thus, Gandalf became aware of the principal differences belying Saruman’s character; though, as yet, it is not fair to call him a traitor. Another important vignette is outlined, as a potential meeting of the Council, in which Gandalf blows from his pipe “a great ring of smoke with many smaller rings that followed it” and “put up his hand, as if to grasp them” (UT 351). It is not at all clear that Gandalf knew of Saruman’s interest in obtaining the Ring for himself, or even that Saruman had such a goal yet—doubtless, though, it remains one of the single most vexing puzzles in all the texts.